This inaugural on-line issue of The Mickle Street Review represents some of the best and most exciting work currently being done in the fields of Whitman Studies and American Studies. It is hoped that the pieces here speak to one another and to a diverse audience of creative writers, students, teachers, and scholars interested in exploring together disciplinary interchanges in American culture in Whitman’s day and beyond. 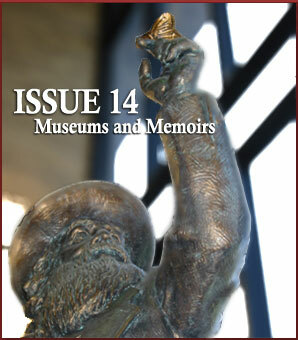 The pivot of this summer 2001 issue—museums and memoirs—points to the importance of these two cultural forms in the framing of American history and in discussions of Whitman in and as history. Issues of identity, memory, and performance, which are integrally related to these forms, are taken up, teased out, and figured in a range of essays, poems, feature articles, archival documents, and reviews. Paul Outka’s piece on Whitman and the Internet, an appropriate portal to this first on-line issue of the journal, suggests that Whitman’s conception of subjectivity offers a way for us to understand the complex entanglement of identity, textuality, and public space, and charts a future for our relationship to this new technology. Stephen Cushman’s musings on the genre of the Civil War memoir and his poem on General Sherman, one of the great memoirists of the War, together stake out issues of identity and memory as they bear on our constructions of history. William Major reflects upon and applies Cushman’s findings in his introduction to the Civil War memoir of Washington Augustus Roebling, the engineer of the Brooklyn Bridge, a memoir that is published here for the first time. Shirley Samuels’s article on Lincoln’s funeral, which attends to Whitman’s Civil War writings, also examines the imbricated concerns of memory and display, as does, in its own way, the review of historian Roy Morris’s book, The Better Angel: Walt Whitman in the Civil War. The dynamics of American memory also lie at the heart of Helen McKenna-Uff’s interviews with curators and teachers at the Walt Whitman House (Camden, New Jersey) and Edgar Allen Poe House (Philadelphia), which shape her essay about the pedagogical possibilities and issues raised by house museums. Joshua Kotzin’s Jamesian reflections on his own life experiences creatively point up the vital intersection of the poetics of autobiography and artifact. And, although not writing about museums or memoirs per se, Vicki Howard and Brady Earnhart further investigate the performance of self as culturally defined and defining within American commercial culture in the late nineteenth century. Finally, Paul Schopp’s sketch of the rise and fall (and rise again?) of Camden, and with it Mickle Street, lights up the title of this journal as well as important aspects of American history and civic development that will be central to it. Special thanks go to Geoff Sill for his continuing support of The Mickle Street Review and his guidance of the Camden On-Line Poetry Project (COPP) of which The Review is part; the Gilder Lehrman Institute of American History for grant support to promote the teaching of American history to secondary-school students through the Review; the staff at the Walt Whitman House; Tom Hartman and Paul Altobelli for their web design expertise; Robert Emmons and Bob Porch at the Rutgers University-Camden Teaching Excellence Center; and Kathy Volk-Miller and Rutgers University-Camden student interns for their assistance along the way. Outka wires Whitman into the rhetorical space of the Internet. Investigating the iconographic display of Lincoln in death. Howard examines the wedding industry at the turn of the 20th century. Reflections on the value of Civil War memoirs. Whitman’s ambiguous entry into the marketplace with Leaves of Grass. Casting Whitman and his butterfly. and its most famous street. McKenna-Uff discusses the interpretation of American life and letters with the curators of the Poe and Whitman Houses. William Major on the previously unpublished Civil War memoir by the engineer of the Brooklyn Bridge. Review of Roy Morris’s book. Stephen Cushman’s first book of poems, Blue Pajamas, was published by LSU in 1998. He is also the author of two books of criticism, William Carlos Williams and the Meanings of Measure (Yale, 1985) and Fictions of Form in American Poetry (Princeton, 1993), as well as of a creative non-fiction treatment of the Civil War, Bloody Promenade: Reflections on a Civil War Battle (Virginia, 1999). He teaches at the University of Virginia. W. S. Di Piero was born in South Philadelphia in 1945. A frequent contributor to Threepenny Review and TriQuarterly, he has published several volumes of poetry. The most recent are The Restorers, and Shadows Burning. He is the author of three collections of essays on literature, art, and personal experience: Memory and Enthusiasm, Out of Eden, and Shooting the Works. He has also published works of translation from the Italian, including a version of Giacomo Leopardi’sPensieri and The Ellipse: Selected Poems of Leonardo Sinisgalli, and in 1996 his translation of Euripides’ Ion appeared. He lives in San Francisco. Brady Earnhart comes from Delray Beach, FL. He holds a BA from The College of William and Mary, an MFA from The University of Iowa, and a PhD from The University of Virginia and has published numerous poems as well as articles on “The Song of Roland” and the ballet Giselle. He is currently teaching nineteenth- and twentieth-century American literature and creative writing at James Madison University. John Giannotti is professor emeritus of art at Rutgers University-Camden. He has a studio in Haddonfield, NJ, where he lives with his wife, Antoinette, and son, Delano. Tyler Hoffman is Assistant Professor of English and Co-Director of the American Studies Program at Rutgers University-Camden. He has published articles on Walt Whitman, Emily Dickinson, Robert Frost, Thom Gunn, and the poetry slam, and his book Robert Frost and the Politics of Poetry is forthcoming from the University Press of New England. He is working on a second book entitled States of Change: American Public Poetry and the Performance of Culture, and is co-editing a collection of essays called The Public Life of American Poetry. He also serves as associate editor of the Robert Frost Review. Vicki Howard is a Woodrow Wilson Postdoctoral Fellow in the Humanities at Rutgers University-Camden and Hagley Museum and Library. She received her Ph.D. in American Studies from the University of Texas at Austin. Joshua Boaz Kotzin has just finished a Ph.D. in English at the University of Iowa. His dissertation, titled “The Museum Mood: American Literature and Modern Styles of Retrospection,” examines the relationship between American literature and the rise of the civic art museum through close reading of fiction by Henry James, William Dean Howells, Sarah Orne Jewett, Charles Chesnutt, and Edith Wharton. He is now a lecturer in the English Department at Yeshiva University in New York. Helen McKenna-Uff is a Park Ranger at the Edgar Allan Poe National Historic Site and a graduate student at Rutgers University-Camden. William Major is an assistant professor of English at Hillyer College, University of Hartford, where he teaches courses in American literature, advanced composition, and composition. His area of specialty is autopathography, and he has recently published articles in a/b: Auto/Biography, ISLE: Interdisciplinary Studies in Literature and Environment, and Arizona Quarterly. Paul Outka has just started as an Assistant Professor of American Literature at the University of Maine, Farmington, following a two year visiting position at the New College of Florida. He received his Ph.D. from the University of Virginia in May 2000, and has written on Asian-American autobiography for Contemporary Literature. A long piece on Whitman, entitled “Whitman and Race (he’s queer, he’s unclear, get used to it…)” is forthcoming from The Journal of American Studies. Outka is currently working on a book on ecocriticism and the sublime. Shirley Samuels is finishing a book called Facing America: National Iconography and the Civil War. She is the author of Romances of the Republic: Women, the Family, and Violence in the Literature of the Early American Nation and the editor of The Culture of Sentiment: Race, Gender, and Sentimentality in Nineteenth Century America. She teaches American literature and Women’s Studies at Cornell University. Paul W. Schopp, a regional historian who has done extensive scholarly work on Camden City and Camden County, New Jersey, served as the executive director of the Camden County Historical Society from 1996 to 2000. He is currently employed as staff historian for A.D. Marble & Company, an environmental and cultural resource management firm located in Rosemont, Pennsylvania. Cushman: © 1999 by the Rector and Visitors of the University of Virginia; from Stephen Cushman, Bloody Promenade: Reflections on a Civil War Battle (Charlottesville: Virginia, 1999) pp. 167-187. Howard images: “1847 Rogers Bros. ‘Silver Plate that Wears,'” 1915, Box 80, N.W. Ayer Collection, Archives Center, National Museum of American History, Smithsonian Institution, Washington, D.C.